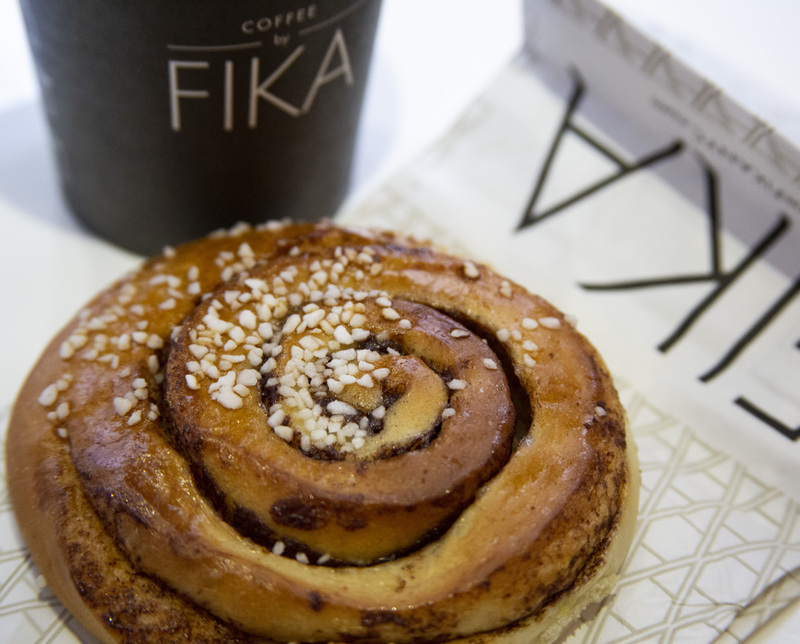 NEW YORK – During a recent trip to New York City, we made sure to fika daily. The caffeine was much needed – and so was the escape from the hustle and bustle of the city. There were no shortage of coffee shops to choose from. It seemed like there was a Gregory’s Coffee or a Starbucks on just about every other corner, along with hundreds of other café chains and mom-and-pop shops. But one thing most cafés lacked were classic Swedish pastries like kanelbullar with pearl sugar, punsch-rolls and princesstårta (because a fika isn’t a true fika without the sweet, flaky treats). So, we sought out cafés offering a truly Swedish experience. FIKA is a Swedish espresso bar with an ambition we can get behind: To make sure customers who spend time at a FIKA store leave smiling and fulfilled. And we did just that. 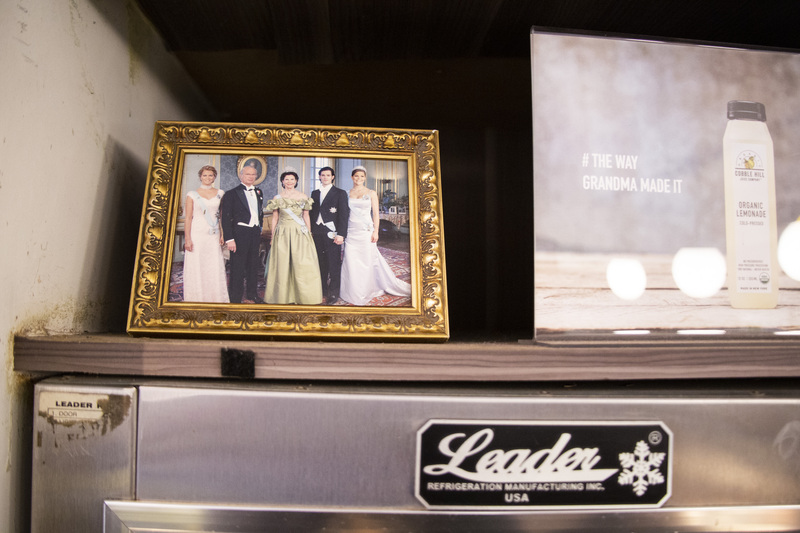 As soon as we walked through the doors of FIKA on 7th Avenue, we were happy to see traditional cinnamon buns behind the counter and photos of the Swedish royals hung in the center of the shop. Each FIKA store varies in size and offerings. The location we visited was a small shop designed for a quick break for on-the-go New Yorkers. 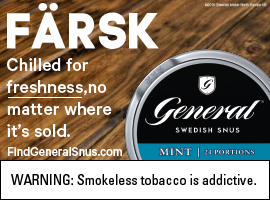 Other locations offer a full menu for breakfast, lunch and brunch, including Swedish dishes like meatballs, cured salmon and open-faced sandwiches. 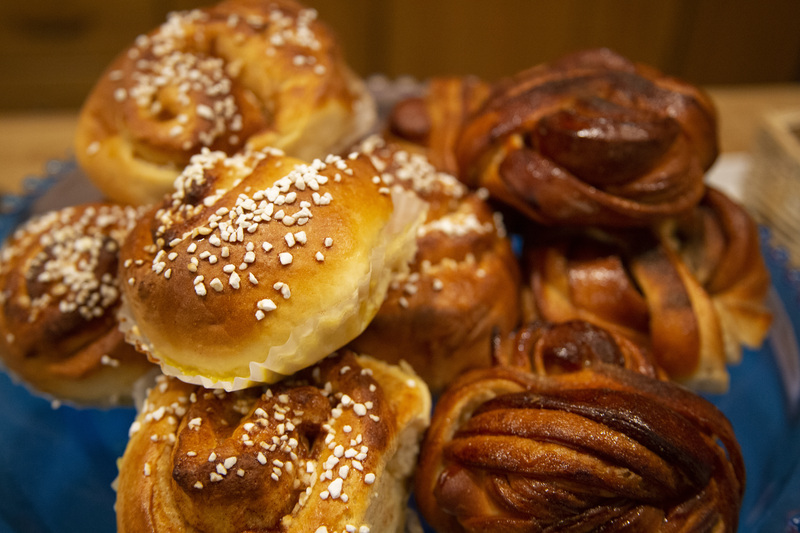 If you find yourself in New York City and in need of a Swedish fuel up, be sure to visit a FIKA. In 2010, a second Swedish-inspired espresso bar company opened its doors to the public in Brooklyn: Konditori. Today there are nine locations across Brooklyn, Philadelphia and Manhattan. Like FIKA, Konditori offers traditional Swedish fare, quality coffee and a cozy environment to fika. While we didn’t get a chance to visit a Konditori café during our recent trip, we can attest to its greatness as another Umgås staffer visited on his own to sample all the carbs the Williamsburg location had to offer. Being the coffee and baking connoisseur he is, we trust his judgment. 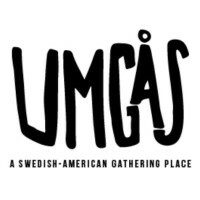 That’s right, the Church of Sweden in New York City can be a place to fika and may be our favorite. Tucked away on 48th Street, we were very surprised to walk into a room filled with hundreds of books and the aroma of freshly brewed coffee mixed with cinnamon buns baking in the oven. The counter had a baking dish filled with steam coming from the fresh-from-the-oven pastries and a plate full of punsch-rolls. There were people visiting family from Sweden who were catching up and others simply enjoying a quick cup of coffee in the warm, cozy space. If you’re looking for a quiet afternoon fika or want to surround yourself with Swedish culture, the Church of Sweden in New York is the place to go. The café is open seven days a week and its doors are open to the public. We kept this post Swedish, but if you want to escape for coffee and pastries – regardless of cultural roots – Eater rounded up the best coffee shops in the city.